What’s a GM to do when their best-laid plans are derailed by pesky players? 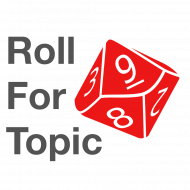 Andy and Chris discuss the many ways roleplaying game sessions can go awry. Transcript below provided by Barbara Tozier! Episode 2: How to stop derails from happening? Chris: Andy, what exactly are we going to do first here? We typically have a role at the beginning of the session. What is that that for? Andy: Yeah, so what we do on the show, Chris, if you weren’t aware, is we roll a D10 and we look on a chart to find out exactly what topic we’ll be discussing. I have a chart in front of me numbered one through 10 and you’re going to roll a D10 and that’s going to determine what we talk about. Chris: Okay, cool. All right, so I’m going to roll that right now. Chris: It’s… Oh, I got a 10! Andy: A 10. Okay. Chris, what we will be discussing today according to our chart, is how to deal with session derails. So that that would be players going off-plot or players doing something that the GM was not expecting. Andy: Well this is going to be a really short show then, because my players always do the exact same. Chris: Yeah whatever I prepped is exactly what they seem to want to do. Chris: Yeah, this is actually a really interesting one that we rolled on, because my last session was maybe you could almost call it 100% a derail. This was a session we went more or less completely off book. They just decided to… they were wrapping up a plot point and they decided to do it in a way I was not expecting, that involved most of the townsfolk. Chris: In a town that they were in, pretty much all the NPCs that they had been relating with were at this public trial of the big bad evil person in the campaign that they were running. So they held this public trial and everybody showed up and so there was a lot of very cool interactions between different NPCs and different motivations coming out of the woodworks, and I was just kind of sitting behind the screen going, “Oh goodness, what am I gonna do? What am I going to do?” as it just got a little crazier and crazier. But yeah, it ended up being a really, really fun session. And they had no combat rolls whatsoever. Chris: This is a _Dungeons & Dragons_ game so that’s sometimes rare for that to happen. Chris: I think it depends on your GM style, right? I sort of like this thing as long as there’s a framework to fall back on. So if they had come to a brand new town for example, and we were introducing a bunch of brand new NPCs, then that would have been hard and scary. But since I had a good handle on what was going on in the town and who wanted what out of the trial, it just made for a lot of fun at that point. I think the other thing, too, that I always try to keep in mind is the players just assume that you’re on top of things most of the time, I guess, unless you’re very bad GM. They sort of assume that you have some vision in your head. So even if you don’t necessarily have it ahead of time, and you’re just inventing it on the fly, it tends to work out okay. It’s like… you’re like a duck on the water, right? You look calm on the surface while you’re paddling. Andy: I think it’s important to take a minute and assure everyone who might be listening that *you* are not a bad GM. You’re an *amazing* GM. Take it from me and Chris. You’re incredible. Chris: Yes. I mean that’s why we have the podcast, right? Andy: A person who was a bad GM would not be listening to this podcast. Chris: Yes. I guess I’m interested right… So that’s very fresh in my mind, that sort of session derail, I guess. That’s a very particular kind of derail. I’m wondering, the spirit of this topic might be more… players just trying something dumb or way out there. “Wha… What’s going on?” Do you have anything that you’re thinking about? Andy: Well, I can tell you a story of me not knowing what to do with a player derail from my gaming history. I distinctly remember once introducing a new player to role-playing. He had not role played before. We happened to be playing the old _Middle Earth_ role playing game and I still remember very vividly what happened. I had a plot set up, and the plot was that the player needed to travel from one town to another: from point A to point B.
Andy: Right? But then, of course, midway along that route, something would come up that would divert them off of their course, and that’s where the adventure was. So I don’t remember what the exact thing was, your classic generic adventure, as “you’re on the road to Neverwinter and oh, here’s the wreckage of a merchant caravan or something that was ambushed. And there’s the goblin track leading to the forest. What do you do?” The expectation is that the players will, of course, follow the adventure that you have planned, head off of the track and go have their adventure. Well this, and in fact, I think most veteran players know when a GM is hinting at them that “hey, this is where the adventure is, you should go down this trail.” But I was playing with someone who wasn’t a veteran adventurer at all. And he was like, “well, that’s not…” when he came across upon that distraction, where the heart of the adventure was supposed to lie, he was like, “well, that’s not what I’m being paid to do. So I’m just going to stay on the road to Minas Tirith,” or wherever he was headed and I didn’t know what to do. I had no idea what to do. So, I just ended up saying after confirming that he was sure and I wasn’t even very subtle about it, “are you sure you don’t want to go follow that troll path?” or whatever it was. I ended up just saying, “well, that’s the adventure you get, that was it.” And I never played a role playing game with him again, and to my knowledge, he has never played another RPG. Chris: Yeah, well, because he tried it that one time and it wasn’t very fun. Chris: I’m curious. You clearly had some time to think about this and think about what you did wrong, but what would you do? What would Andy today do if that happened? Andy: Great question. I don’t, this will sound terrible, but I don’t exactly know what I would do in that situation. I think probably the main problem was that the player just didn’t have a big enough incentive to go off of the beaten path, off of the plan and into the adventure I had designed. He was probably thinking pretty logically, “Why on earth if I’m headed to city B, would I allow myself to be distracted by a bunch of goblins?” or whatever it was. So I think what I would do now is just make sure that if I am hoping to lure players off of the path they were expecting to be on, just to make sure that that lure has a strong enough hook, in either the personalities of the player characters or by some other means. That there’s a good chance that in fact they will be tempted to go follow the adventure path. Chris: Yeah, that makes a lot of sense. That’s the D&D starter set for 5e, right? That’s the beginning part of the adventure, you’re traveling from one place to another and you run across the wreckage of an ambush. Chris: Right. But you recognize parts of that ambush as someone that you knew. So, in that way, if it was just some random cart that was overturned, it’d be pretty easy to just sidestep it and keep going. Chris: Totally. Have you ever had that happen where a player just gets really interested in something that just does not have anything to do with what the rest of the party wants? Andy: Definitely. And it happens in all sorts of different ways, right? It happens with players just getting it in their heads to go left when you really think they ought to be going right and you’ve tried to seed in their minds that they should turn right. It also happens with players coming into the game with a different expectation for what they want to be doing. If what’s fun for them and what they’re looking forward to doing in the game is different from what’s fun for you and maybe the rest of the group, you’re going to be fighting those derails basically every time they are talking. Chris: Have you had players like that, who clearly want something out of the game that they’re just not going to find out your table? Andy: Yeah, definitely. I’m struggling to think of a specific example. I can’t really point to too many players in my gaming history that were just enormously at odds with the rest of the group. I think that almost every player, at some point in the career of their player characters, they’re just going to want to do something that’s a little different. Or that’s, I don’t know, they’re just going to get a little bug in their minds to go explore something, or do something, or make a choice or, be stubborn about something you didn’t expect them to be stubborn about. So I think that this isn’t just a topic of “How do you deal with the one guy who’s constantly derailing the game” and it’s more question of “Everybody is going to probably derail the game in a way that’s really unique to them. How do you as GM prepare yourself when somebody unexpectedly throws you a curveball?” What do you think about that? How about you? Does anyone spring to mind when we talk about player derails, as someone that you’ve played with who’s really constantly throwing this sort of thing at you? Chris: …where, it’s like, “Okay, well, I’ve just asked for something that maybe the GM hasn’t fully thought through, let’s see what happens. If it’s nothing, that’s fine. If it is something, great!” I would just add, I would rarely gate some sort of big thing behind that curiosity. It would just be a small flavor thing is usually what I try to do. Andy: How much pressure do you feel as a GM to roll with the derail versus saying, “I don’t know, that’s not something I planned or thought about.” Would you, could you ever say to a player “I don’t know what the name of that person is,” or “I don’t know the answer to your question or, to what you’re doing. That’s not what I planned, let’s skip it and move on.” Could you ever say that? Or do you feel pressure to try and fake it until you make it? Chris: Yeah, I feel some pressure to fake it. But I think that’s a good pressure. I can be creative within a framework pretty well, and if I have that framework too solidified in my own head, it can be very hard to break out of that. But if a player breaks me out of that, then it can be a good extra thing, extra flavor to add to the game. There’s this one session that really sticks out in my mind, that I ran during one of my lunch games, where they had decided that they wanted to go up to another city. They wanted to stop exactly what they were supposed to be doing and go do something that was totally separate from what they were doing, and I was a little scared. I was like, “Well, if you do that, we’re going to introduce this whole new city and this is just getting so off the beaten path from what you’re trying to do.” What I ended up doing was I gave them a choice in the game because they were trying to clear out a goblin stronghold such as what they were supposed to be doing. While they were on the road up to the other city, I had some goblins show up off in the distance. So then it was their decision. “If you want to keep going down this path, sure, we’ll figure it out but also, I’m reminding you very specifically of this thing you’re supposed to be doing, this thing that you are saying no to right now.” Thankfully, they took the bait, if you will, and went up towards the goblins and things went off from there. But it was an interesting moment because that was something that’s, of course, not written in the adventure for what to do if they decide that they’re not going to go to the goblin stronghold. So I did think a little bit on my feet and it ended up being a really interesting combat encounter, too. Andy: One thing that’s occurred to me as we chat here is that when we say the word “derail,” we are suggesting the presence of a rail, right? I know gamers have lots of different feelings about “railroading as a thing” adventure. So where on a scale between… on the one hand, you have a very tightly defined plot that you are expecting the players to go through, and that you plan to nudge them along to reach a foreordained conclusion or plot points. If that’s on one end of the spectrum, and on the other end of the spectrum is a “there is no story but… here’s a region full of NPCs with plot hooks and you make your own story.” Where do you fall when you come to a game session? Chris: I definitely fall on the pre-written module end of things, but flavoring it as they’re going through. Partly that’s just because of the time that I have available to me to play. I think if I had more time in a more regular group that met for hours at a time, maybe once a week, I would be more open to the, “well, let’s just kind of see what happens” sort of thing. But since, for at least one of my groups, a couple months can go past before we can meet back up, it’s very valuable to have everything written down by someone else who’s thought through the whole thing. Because otherwise, you come back to the session and it’s like, “Well, okay, what’s my character’s name first of all?” And then “What were we doing?” If you have a module you can kind of jump back into and say, “okay, well, we’re roughly here and… if you’ve forgotten stuff I can just look it up.” It sort of puts more burden, I think, on the GM for holding the state of the world in their head if you’re doing pure homebrew, hundred percent homebrew. That’s not where my gifts lie. Some people are really good at that, but it’s hard enough for me to juggle three NPCs let alone everybody that they might… What about you? Where do you fall? Andy: Yeah, I share your general approach, I think. I have a lot of fondness in the abstract for the open world, very little pre-written plot. “Let’s see where your character motivations and interests take the story.” I’m very attracted to that idea, but in practice I don’t really run games like that very much for many of the same reasons you do… Most of my games these days are with busy adults, or with my kids and their friends. And there could be a big gap between game sessions. For instance, when you have busy adults who are committing to get together once a month for a game session, that time is precious, that time is not being spent with their family or their work or whatever it is. And as a GM, I feel a little more pressure in sessions like that to make their time be worth it. This might be a misguided idea but if we end up kind of futzing around to no effect for three hours in one of those once a month sessions, that kind of feels to me like I wasted people’s time. That might not be the right way to think about it, but that’s certainly how I feel. So I feel a little pressure in those cases to have more of a plot that I can keep moving. When you don’t meet as frequently, I feel like you just can’t afford some of those filler, more aimless distractions and sessions that when you’re 13 and playing four times a week, you can easily indulge. Chris: Yeah, it’s almost like, if you have the written module, you can introduce that next big event that moves things forward. You always have that written down. I think, at least in D&D, that’s the game that I’m playing right now most heavily, it can tend to be a very silly game, just by the nature of it. Chris: So if you can balance the rails of the pre-written adventure with the silliness of the party kind of bumbling through and making jokes and stuff, it’s a good counterpoint to each other. So you have this very serious plot going on, but then you also have “the dwarf fell over and dropped the mace.” Or they just want to make jokes all the time, or make fun of the evil guy. So that can be… that to me is a good balance between those things where I think I would have a hard time if you had that sort of silliness of D&D, but then also you have to indulge in their kind of weird, weird jokes because that’s the plot points you’re being given. Chris: Which I can imagine… teenagers playing, right? That can get quickly get pretty off color, and gross. Chris: But with adults, I think the opposite happens. It’s just kind of like boredom, and “well, there’s probably something else I’d rather do with my time than this.” Where’s the line? When you’re talking about a derail? Where’s the line between someone just constantly joking, and then really fully derailing the whole session? Andy: I think most groups probably have at least someone who’s more inclined to be joking around a lot. It probably just depends a lot on the character of… the personalities in your group. I mean, as a GM, one of the things you have to be constantly doing is reading the table. I think if you know your players pretty well, it’s usually pretty clear when things are starting to go a little awry. Have you had this pop up in some of your games? Chris: Do derails happen in dungeons as much as they do in town? Andy: In my experience, not so much. Although no… for me, most of the derailing happens in between the adventuring part of a game. Once they’re out in a dungeon or, once they’re in an environment like a dungeon there’s a lot of constraints that you as a GM can use to put pressure on them to keep moving or to keep on course. It’s those more open-ended things like when they’re interacting with NPCs around town, or they’re going shopping, or they’re hanging out at the inn after their adventure. It’s those times like that, where there’s just less inherent structure in the scene, that I think you’re more likely to have people start getting it in their minds to do something that you weren’t planning on them doing. Andy: Absolutely. Sometimes a derail is the players’ way of telling you the kind of game they’d rather be playing than the one they’re playing right now. Andy: I could probably come up with a good number of examples here. One area in which derails can be kind of dangerous is… I have run a lot _Call of Cthulhu_ in my gaming life. That’s more of an investigative game where players are looking for clues and trying to unravel mysteries. And in games like that, it’s not too hard for players to follow red herrings or to think that some random NPC you don’t even have a name for is the villain they need to know. That certainly happened. For example, I was talking about sometimes they’re kind of telling you the kind of game they would like to be playing: I remember one _Call of Cthulhu_ game, one of the characters had a background as being a psychic. And when they rolled up the character, I didn’t really think that the psychic character was going to be like a real psychic with actual psychic powers. I just thought it was a flavorful background. Once we started the game, it became clear that the player had envisioned their character as a psychic with psychic powers, and so they at all of the scenes they were visiting, the player was saying, “I’m going to touch the murder weapon and focus and what kind of vision do I see, or what?” And I had no idea! It ended up being kind of terrifyingly fun, as I switched from what I thought was going to be a pretty gritty straightforward detective mystery story to a psychic detectives following… Clearly the players were having a lot of fun with it, and they thought it was really cool that the player was getting these psychic flashes and I was just kind of madly making up on the spot these visions and psychic clues this person could be getting. I had no idea where it was all going to end. It ended up being really fun. That’s something I look at; in that was an example where the player just had a different idea of what was fun about their character than I did. I am glad that I didn’t say “Oh, hey. No, actually, you don’t actually have real psychic powers. That’s just a piece of flavor background.” I’m glad that I resisted the urge to do that, because I certainly had that urge. Instead, I just did this panicky “Sure! You’re saying you see a vision or you’re hearing voices or something.” I’m glad that I tried to run with it, even if I definitely wasn’t completely successful with it, because… I don’t know, people had more fun and it ended up being a neat part of the game. Chris: It’s like there’s almost a difference between a derail that snaps you out of your thing that you have planned and a derail that’s just someone that needs to goof off for a minute because they need to blow off some steam. Andy: Yes, well we’ve really come around in just our short discussion here, Chris. Andy: Oh my goodness, Chris, this story. This story would have been perfect if they had actually literally derailed the train against your wishes. That would have been the perfect closer to this discussion. Chris: Yeah, it really would have been. I need to revive that. That train heist was really good, and the thing that I learned from it was that I just needed to start on the train. Not trying to get them to get onto the train. Andy: Yes. If you do have to, if you are really counting on the players turning left instead of right, you need to maybe start the game with them turning left. Chris: Or you turn them left and then a quick flashback to before. All right. Well, let’s wrap up there. Again, this has been _Roll for Topic_. My name is Chris Salzman. Andy: And I’m Andy Rau. Chris: Thank you so much for listening. Bye.